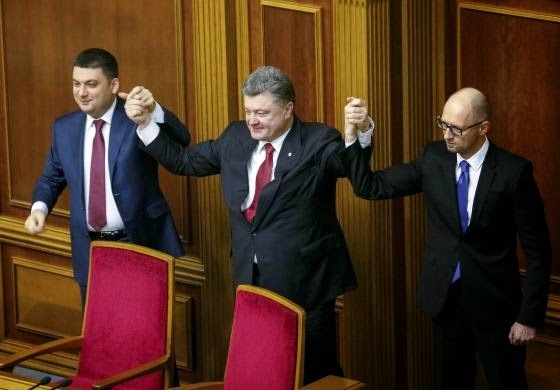 KIEV, Ukraine -- Ukraine's parliament voted in a new government on Tuesday, putting foreign technocrats in key financial roles and renewing terms for the foreign and defense ministers in a signal that no major change in policy is likely on the rebellious east. Ukraine's President Petro Poroshenko (C) holds up the hands of newly appointed Prime Minister Arseny Yatseniuk (R) and newly appointed Parliament Speaker Volodymyr Groysman during a parliament session in Kiev. Parliament endorsed Pavlo Klimkin as foreign minister and Stepan Poltorak as defense chief in the cabinet of Arseny Yatseniuk as shelling persisted in eastern Ukraine despite a fresh truce deal between government troops and pro-Russian separatists. Kiev has been under international pressure to form a new government quickly to tackle Ukraine's near-bankrupt economy and the months-long separatist crisis after political parties favoring closer relations with the West scored a resounding victory in the October parliamentary election. "2015 will be even more difficult than the current year," Yatseniuk told deputies ahead of the vote. "We are ready for the most radical, tough and effective reforms." The new cabinet includes foreign technocrats in pivotal posts such as finance minister for Natalie Jaresko, a U.S. citizen, who has worked in Ukraine for more than 20 years after holding various economic positions in the U.S. State Department. The parliamentary vote did not pass without mishap. The speaker had to call a second ballot after complaints from coalition members - a display of internal disagreement that bodes ill for the parliament's ability to thrust through the reforms it must deliver to ensure Ukraine gets more Western aid. The other two foreign appointees to the cabinet were Lithuanian Aivaras Abromavicius, a partner in investment firm East Capital, and Georgian Aleksander Kvitashvili, who are now economy and health ministers, respectively. Under Poroshenko and Yatseniuk, Kiev has cut aid to the eastern regions held by pro-Russian rebels since soon after protesters toppled Kiev's pro-Moscow president in February. Fighting has continued despite a ceasefire agreed on Sept. 5. In the rebel stronghold of Donetsk a senior separatist figure said rival sides agreed a new local truce from 10.00 a.m. ET around the city airport. "But this is 65th time we agree about this. I don't rule out that there is going to be 66th time," Andrei Purgin said. Sounds of fighting abated but did not stop. Kiev said rebels renewed attacks on the airport in the evening. Russia acknowledges supporting the separatists but denies Western charges of being a party to the armed conflict.